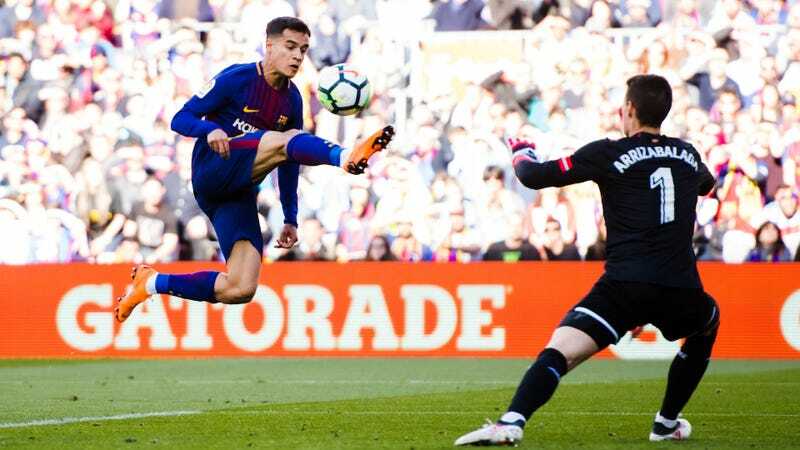 Are you a Barcelona fan angry that the team’s chances of winning the treble this year are significantly hampered because Philippe Coutinho isn’t allowed to play in the Champions League? Are you a Gooner worried that Arsenal might fail to win the Europa League and in the process consign the once proud club to yet another season in Europe’s scrubs tourney all because UEFA won’t let Pierre-Emerick Aubameyang lace ‘em up in that competition? It may be scant consolation for those teams now, but UEFA has eliminated the dumb rule that made the above-mentioned situations possible going forward. UEFA’s current rules hold that if a player has been registered to compete in either the Champions League or the Europa League for one club, then that player cannot compete in that same competition later for another club. This primarily affected players leaving one European-competing team for another during the January transfer window. Hence why Coutinho, who played in the Champions League for Liverpool before moving to Barcelona, and Aubameyang, whom Borussia Dortmund registered for the Europa League before transferring him to Arsenal, can’t compete in European play for their new clubs after big-money moves in January. This rule never really made sense, so it’s good to see it gone. Starting next season, UEFA will allow teams to register up to three new players who had previously been registered by their prior clubs to compete for their new clubs in the same European tournament. Thus it’s not an outright abolishment of the so-called “cup-tied” rule, but in effect it should more or less prevent this stupid loophole from potentially wrecking a team’s European aspirations for no good reason. For a team like Barça, today’s announcement is bittersweet. It’s cool that their next Coutinho won’t be screwed over, but it doesn’t help the current Coutinho much. For certain Machiavellian Arsenal fans, though, maybe the rule change will prove to be fortuitous timing after all, if a Europa League exit means the club decides to finally fire Arsène Wenger.